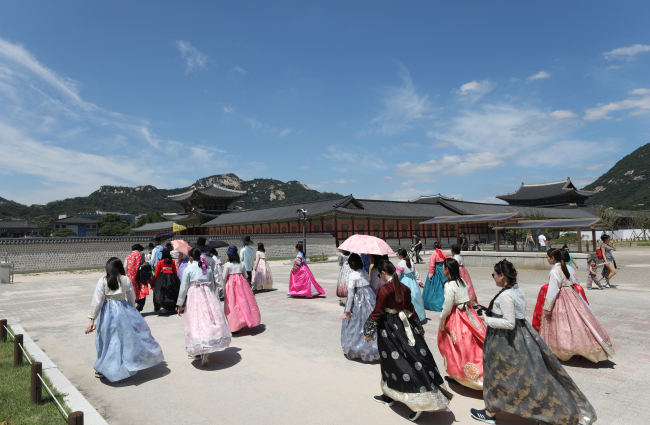 The number of foreigners who visited South Korea spiked 24.4 percent in July from a year earlier on eased inter-Korean tensions and more tourists from China, South Korea's tourism promotion agency said Thursday. A total of 1.25 million foreigners visited South Korea last month, up from 1 million tallied the same month a year earlier, according to the Korea Tourism Organization. The number of Chinese tourists shot up 45.9 percent on-year in July due to a base effect. In March last year, China banned group tours to South Korea in retaliation for Seoul's deployment of a US anti-missile system. The ban has been partially lifted since later that year. The number of visitors from Japan surged 35.1 percent on-year, with that of tourists from the rest of Asia and the Middle East climbing 13 percent. The tourism promotion agency attributed the growth to the stable inter-Korean relations.